Does this mural really look like a terrorist? Many artists shy away from explaining their work, and the twin brothers Otavio and Gustafo Pandolfo are no exception. The Brazilian pair, who paint under the name Os Gêmeos, may have produced this mural, The Giant of Boston, on the side of an air intake in the city's Dewey Square, yet they won't be drawn as to the picture's meaning, other than it being a means to promote their current show at the city's Institute of Contemporary Art. However, respondents to an online poll hosted by a local Fox TV station, have described the image as that of "a terrorist" or a "Mooselim protected by Obama". The square is a sensitive location; Boston's Occupy camp was pitched here last year. Os Gêmeos, who come from a graffiti background, often paint figures with obscure features. 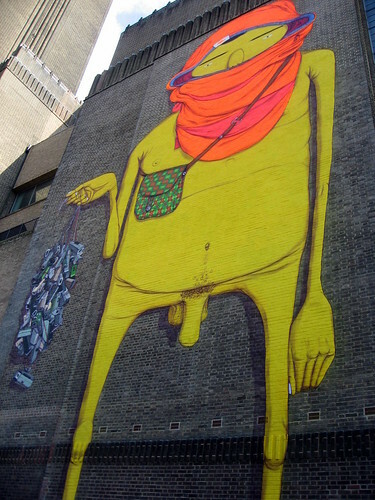 This (not entirely sfw) mural bears a strong likeness to the Giant of Boston, yet it displayed on the side of London's Tate Modern back in 2008 without complaint. Thankfully, the burghers of Boston have redressed these Islamicist charges. Mayor Thomas Menino told Reuters, "We don't need somebody out there to divide us and saying that's a racist thing, that's against a religion. It isn't." Meanwhile, Jill Medvedow, the director of the museum said "This work of art is a joyful addition to Boston's skyline. With tremendous mastery of scale, painterly skill and vibrant patterning, Os Gemeos brings urban energy and a rich tradition of Brazilian creativity to Dewey Square in Boston." Not convinced? Then there's still plenty of time left for you to visit and decide whether a playful mural threatens Boston's social fabric. The Giant stays in the square until November 2013.